What an eco-friendly week for children’s media. Just when I thought “why isn’t kid’s TV more eco-friendly?,” other types of content delivery have stepped up to the plate to teach kids about environmental issues and green living choices. 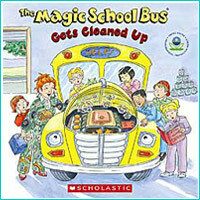 Scholastic and the Environmental Protection Agency (EPA) joined forces to release “The Magic School Bus Gets Cleaned Up,” a new book from the “Magic School Bus” series that explores the ways people can protect themselves (including their lungs) from air pollution. Scholastic’s traveling Magic School Bus, a traveling interactive science experience for kids, has also added a new, more sustainable filter which has already reduced its diesel particulate by up to 90 percent. In the online front, imbee.com, the social networking site for kids ages 8- to 14-years old, announced a partnership with National Geographic Digital Media to create an online community group for Earth-loving kids and tweens. “There’s something powerful about giving kids the tools to express themselves and to share common interests such as a love of animals and the environment that National Geographic represents,” says Betsy Scolnik, president of National Geographic Digital Media. Members of imbee.com can join the group of world-conscious young citizens to read and comment on Earth-focused — and parent approved — blog entries, view videos, listen to world music, and test their geography skills (sounds a bit like Panwapa, but for a slightly older audience, no?). Before joining imbee.com, each enrollment requires parental permission through a verification process (no anonymous emails) to ensure parents are aware of their child’s online goings-on. For grownups, The George Lucas Educational Foundation recently launched the “Go Green Database.” Although not particularly media oriented, the database features green projects, lesson plans, service-learning opportunities and other resources for educators. Each item is searchable by topic, grade level, cost and location, allowing for users with particular needs to find exactly what will work for their own programs. Have you found any new green kid’s media you’d like to share? Is the online space the best medium to unite “Earth-loving” kids and tweens? Image courtesy of Children’s Media Consultant.